Matsumoto Castle is one of the most well known and well preserved castles in Japan, along with Himeji Castle and Kumamoto Castle. This is an authentic Samurai fortress with big walls, moats, and towers, and it can be visited on a day trip from Tokyo or other parts of Japan. 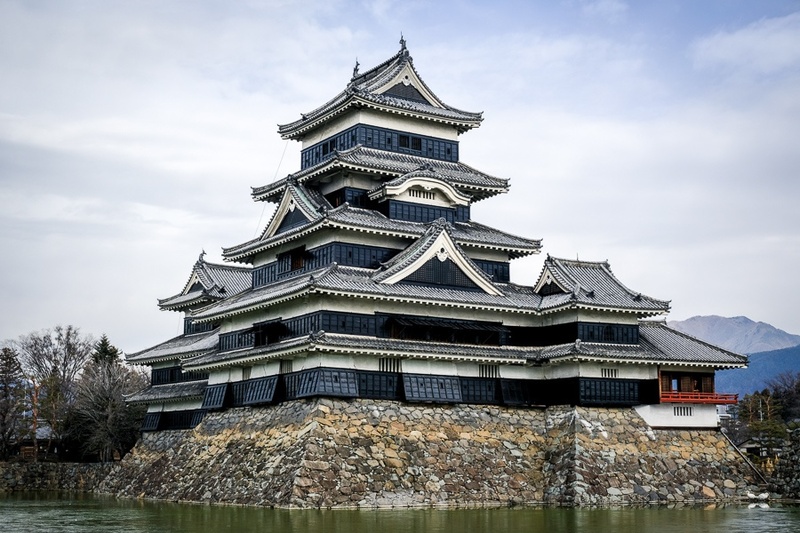 Matsumoto Castle was originally built in the 1500s, and most of the buildings surviving today date back to 1594. Over the years, it was ruled by some famous Samurai like Tokugawa Ieyasu. During that time it was called the Crow Castle because of its black colors and rooftops that look like spreading wings. The castle has been damaged by some earthquakes, most recently in 2011, but good restoration work has kept it looking as nice as ever. Today, the castle is listed as a National Treasure of Japan. When you first arrive at Matsumoto Castle you’ll see a big moat (it feels like a pond) surrounding these photogenic black and white towers. The Crow Castle really does live up to its name. Some of the best photo spots are actually on the outside of the castle moat, before you even pay the entrance fee. The red bridge on the west side of the moat is my favorite spot to take pictures, and it’s also the most popular. There’s usually a small group of photographers hanging out by the red bridge. If you head west this way, there is no entrance but you’ll reach some nice photo spots along the moat. If you head east, you’ll find a gate leading into the main castle grounds. There’s a gift shop and a big courtyard here, with some more nice photo ops looking up at the castle from below. After you get done walking around the Matsumoto castle grounds, you can go inside the main keep and climb all the way up to the 6th floor for some good views of the city. To go inside you will need to take off your shoes and carry them in a bag. Backpacks are not a good idea either because the stairs are very steep and narrow. Sadly there’s no bag storage counter, so I just left my big backpack with a friend in Tokyo. Even if you don’t go all the way to the top of the castle, there’s a good mini-museum on the inside with Samurai armor, guns, and other artifacts, and pictures are allowed. Tickets cannot be reserved in advance, but the castle closing time is extended to 6:00 PM during the busiest days around Obon and Golden Week. Only the main castle area is closed at night, so you can still walk around the castle moat even after dark! The castle is lit up at night and makes for some uniquely epic photos. Matsumoto Castle is located in the Nagano prefecture of Japan. It can be reached from Tokyo or other parts of Japan using the bus or rail network. This is a long journey taking about 3-4 hours one way, but it’s not as bad as it sounds. The cheapest option is to take the bus from Shinjuku Expressway Bus Terminal, which takes about 3.5 hours one way and costs ¥3,800 ($34.50). As you exit Matsumoto Station, it’s just a 5 minute walk to the castle. The most popular months to visit Matsumoto Castle are late March to mid-April, with the first and second week of April being especially busy because of cherry blossom season. Golden Week (first week of May) is also very busy because of the holidays. I personally think the castle is amazing any month of the year, so I say just go when the crowds aren’t around! I went in January and the lake was partly iced over, but I had the whole castle mostly to myself. There is no way to reserve tickets in advance, so if you go during peak season you’ll have to be there early in the morning to get tickets.